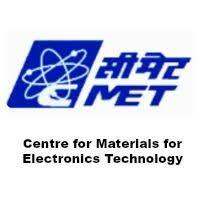 Centre for Materials for Electronics Technology - CMET 2018 Jobs Notification. CMET is inviting applications for the posts of Project Assistant, Administrative Assistant. Interested and Eligible candidates can apply for the positions. Last Date for Submission of Application is on August 28th, 2018..
3. Salary: Rs. 10,000/- per month + 24 % HRA consolidated. Age: Project Assistant-II and Administrative Assistant not exceeding 28 years as on 28/08/2018. Age relaxation for various categories as per GOI norms. 3. Salary: Rs. 16000/- per month + 24 % HRA consolidated. 1. Candidates are expected to bring their application/bio-data and produce original educational mark sheet & caste certificate etc. at the time of screening. 2. Nature of Position: The engagement to the above positions is purely temporary and time bound as mentioned above. 5. The selected candidates shall not have any legal right to claim his/her regularization/appointment by absorption or otherwise against any regular post or any further contractual engagement on termination of the scheme/project. 6. Only Indian Nationals need apply. Appointment of selected candidates is subject to his / her being declared medically fit as per the requirement of C-MET. C-MET reserves the right to cancel / terminate the candidature at any point of time during the engagement process, if any wrong declaration, misrepresentation or concealment is detected. 7. All the candidates are required to produce original documents related to educational qualifications, date of birth, work experience, caste, etc at the time of registration / interview. Duly self-attested photocopies of all the documents must be enclosed along with the application form. Only self attested recent passport size photograph should be pasted in the appropriate place in the application form. Only short listed/screened-in candidates will be allowed for attending interview. C-MET invites eligible and highly motivated candidates for Walk-in-Interview on 28/08/2018 (Tuesday). All the candidates are required to produce original documents related to educational qualifications, date of birth, work experience, caste, etc at the time of registration / interview. Duly self-attested photocopies of all the documents must be enclosed along with the application form. Only self attested recent passport size photograph should be pasted in the appropriate place in the application form.